Rapid City is attractive, but the roadsides outside it are defaced by such a multiplicity of signs advertising so-called “tourist attractions” that it defies description. The big mystery to outsiders is why state and county and municipal officials and lawmakers tolerate this pollution of the South Dakota landscape which is certain, later if not sooner, to drive tourists away. —Chicago Tribune travel editor Kermit Holt, April 28, 1974. Nearly 40 years later, billboards have not driven tourists away. Last year, tourists spent a record $304 million in Pennington County and booked a record number of hotel rooms in Rapid City. But concern about billboards cluttering the landscape also has not gone away. After unsuccessful attempts to restrict billboards through the state Legislature and through a city task force, local billboard opponents are forcing the issue. For the first time next week, Rapid City voters will have a direct say in controlling billboards with two initiated ballot measures. The first measure would ban new digital billboards, double the required distance between new and existing billboards to 2,000 feet and fix the maximum size at 250 square feet. The second would establish a 20-year expiration date on sign credits, the city’s currency for new billboards. If the measures pass, voters won’t wake up June 8 to a billboard-free city. But supporters hope that over time, the changes in Rapid City will contribute to the continued gradual reduction in signs in the region. Opponents say just the opposite will happen: that without the ability to trade old, unprofitable signs for a smaller number of more profitable digital signs, there is no incentive to reduce the number of signs. There is no historic count, but judging from old news reports, it seems there are fewer outdoor advertisements today than decades ago. A 1963 Rapid City Daily Journal article, “Billboard Jungles Again Target for State Action,” reported there had been 84 signs between Wall and the Badlands on what is now S.D. Highway 240, the Badlands Loop Scenic Byway, until Wall businessmen secured rights of way and replaced them with just three signs. Then and now, efforts to limit billboards have been two steps forward, one step back. That same year when the Wall community tore down the sign clutter, 1963, three attempts from state lawmakers to control signs failed. The number of billboards in Rapid City has declined since 2002, when the city began offering “credits” to encourage sign companies to remove old, dilapidated signs. Legal signs that don’t conform to sign code can be removed for two sign credits. Since 2002, 54 signs have been removed for credit, 19 have been removed without their owners requesting credits, and only three new signs, for six credits, have been built, according to city code enforcement officer Andy Chlebek. There are 197 sign licenses active in the city, with each license covering one sign structure; some structures have as many as two or four billboard faces attached. 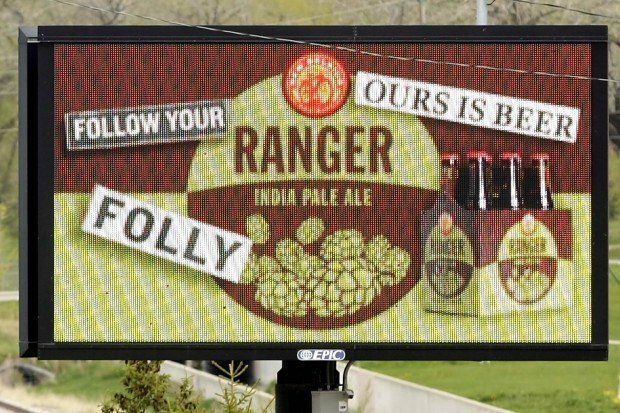 A city task force recommended the exchange of two sign credits for every new digital billboard after studying the matter. But city approval was delayed after a committee killed the proposed ordinance, saying it was too narrow and should instead address all of the city’s outdoor advertising concerns. A second task force the mayor convened to address the city sign code became embroiled in politics. The group called for public input at two hearings this past winter. By March, frustrated that the task force was too heavily weighted with sign company representatives and not taking citizens’ concerns into account, a group of billboard opponents formed the Scenic Rapid City Committee and started gathering signatures for two ballot initiatives to limit billboards. They ultimately turned in more than 4,000 signatures. “If we hadn’t done the initiative, they’d still be sitting there,” said group member Mike Quasney, manager of the Mount Rushmore Road McDonald’s. 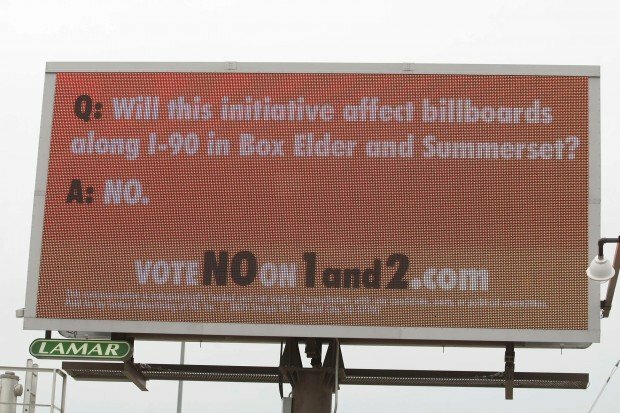 Lamar Advertising representatives said the last-straw citizen group’s measures wouldn’t be necessary without the more controversial moving-picture electronic signs put up by rival Epic Outdoor Advertising under a “public purpose” ordinance exception the city created for its own sign near the Rushmore Plaza Civic Center. “I don’t think any digital boards, whether on premise or off premise, should have any motion on them,” Lamar general manager Doug Rumpca said. But Lamar does plan to continue erecting nonanimated digital billboards. Digital is the tradeoff for the company removing its older and bigger traditional billboards. “We had plans to continue that trend and either downsize or remove additional billboards but cannot do that without being able to convert some of our boards to digital based on loss of revenue,” Rumpca said. That is why Rumpca believes the initiated measures will stop the overall decline in billboard numbers. “The very thing the petitioners are trying to accomplish will not happen if these measures pass,” he said. Some states and communities have outright bans on all billboards. Alaska, Hawaii, Vermont and Maine, all known for their scenic vistas, have banned billboards for decades. More recently, cities have created bans on digital billboards as the technology emerged. USA Today reported last year that more than a dozen cities, including Denver, and several states, including Montana, have banned digital billboards. Billboard manufacturers try to fight the bans. “To my knowledge Rapid City is the first in the nation to propose a ban on electronic billboards,” said Terra Fisher, legislative advocate for Brookings-based Daktronics, despite clear evidence to the contrary. Daktronics, a major national maker of digital billboards and scoreboards, paid for a mailing to Rapid City voters about five weeks ago, showing a half-dozen digital billboards, all with public service messages. Fisher said the signs can display helpful and timely messages such as Amber Alerts, are a cost-effective form of advertising for local businesses, help reduce the overall number of billboards and have not been shown to be hazardous to drivers. Fisher said that the measures would harm Daktronics’ ability to expand — “What if you were told you could never have a raise again?” — and also suggested the measures are illegal. Acknowledging “I’m not an attorney,” she cited the section of state law that relates to highway beautification and regulation of advertising. The law forbids “blanket prohibition” of outdoor advertising in a South Dakota city or other jurisdiction. Scenic Rapid City points to the same law, saying their measures are not an outright ban on outdoor advertising and that existing billboards will be allowed to remain. Local outdoor advertising companies also raise this legal issue. Epic Outdoor Advertising officials say the measures are illegal and have threatened to sue, and Rumpca with Lamar said there are “legal issues” that Lamar won’t pursue until it sees the outcome of the election. But representatives of the citizens group Scenic Rapid City Committee say they worked with attorneys at Goodsell Quinn Law Firm to carefully craft the measures to adhere to the type of restrictions that are allowable in South Dakota. The group believes it is within the city’s rights to ban new digital billboards and to restrict where new traditional billboards can be placed, protecting undeveloped corridors such as Catron Boulevard. “We thought, ‘What can we do to change that’s defensible?’” said group chairman Jim Petersen, an environmental consultant who is married to Ward 5 Alderwoman Bonny Petersen, who tends to vote in favor of tighter billboard restrictions. He describes the group’s work as a “David and Goliath” matchup against big sign companies. He said the group members have no financial stake in the outcome of the election. Reports on campaign contributions aren’t due until the last week of May. Besides Petersen, Shaw and Quasney, group members include Debra Jensen and Lisa Modrick, both Mount Rushmore Road Group members who have businesses on the strip, state Rep. Mark Kirkeby, who has proposed several statewide measures to tax and curtail billboards, historian Pat Roseland, architect Fred Thurston and local residents Greg Iverson, Ethel Telkamp and Cathie Calhoon. At one recent Wednesday afternoon meeting, the group talked about its campaign postcard mailing and organized a series of community group speaking engagements, figuring out where they could get the needed extension cord and projector. The members debated whether it would be a good idea to face off with billboard interests in a public forum, deciding that an educated, moderated discussion could only help their cause. Members of Scenic Rapid City said the measures will improve the image of the community for locals and tourists and prevent new, distracting digital billboards from going up. They said the signs are dangerous to drivers, even though billboard industry officials say no studies have conclusively demonstrated this. Petersen, who was involved in opposing Black Hills Power’s effort to raise electric rates last year, describes electronic billboards as power hogs that will drive up the cost of power. Group members believe their efforts will be successful and the beginning of a new era of control statewide. That’s because of the thousands of signatures in support of the group’s petition and because the measures don’t make changes to existing billboards. A win would be a change for Kirkeby, who has grown accustomed to defeat trying to battle billboards in Pierre. In 2010, he sponsored a bill to remove a property-tax exemption on billboards, saying they are permanent structures and should be taxed just as communications towers are. The measure would have raised about $500,000 annually in taxes on an estimated $25 million worth of billboards statewide. Business and tourism interests lobbied against it, including Wall Drug, the South Dakota Innkeepers Association and the South Dakota Retailers Association. This year, Kirkeby tried a different tack with a bill that would have allowed cities and counties to ban new billboards within their borders. West River lawmakers favored the measure 17-3 but as a whole the House voted 35-34, coming up one vote short of the 36 needed. Billboard companies and business groups along with the state Department of Transportation lobbied against the bill. Kirkeby said the measure would have allowed individual communities to have the same control over billboards as they do over the location of a new liquor establishment, zoning, adult entertainment and tax increment districts. The impact on tourism hasn’t been a big issue in this vote, and tourism interests are staying out of the debate, some saying it is too political. Rapid City Convention & Visitors Bureau executive director Michelle Lintz said the bureau is not taking a position. The Rapid City Area Chamber of Commerce has not taken a position. The South Dakota Chamber of Commerce, South Dakota Retailers Association and South Dakota Visitor Industry Alliance — which have all lobbied against new billboard restrictions on the state level — did not return calls seeking comments for this story. Local tourism operators have not publicly spoken out for or against the measures. And no one is claiming that the success or failure of the measures would impact the visitor industry. Whatever the outcome of the June 7 vote, it won’t be the last debate over billboards. The city of Rapid City’s task force still plans to release a number of new recommendations on sign controls. Scenic Rapid City will still fight for more attractive roadways. And they are going statewide: They have already incorporated Scenic South Dakota. Should electronic billboards be prohibited?